Put them together and what do you have.......a delicious and nutritious breakfast or snack! The other day a friend brought me all of these and I have been enjoying them together. This is one of the brightest strawberry Papaya's that I ever cut open. And, since it is Lilikoi season, I put Lilikoi on everything. What's even better is that everything is local! 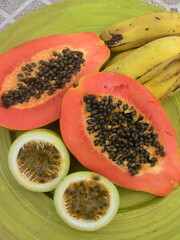 Seed the Papaya, fill with chopped banana and top with Lilikoi. Yum!